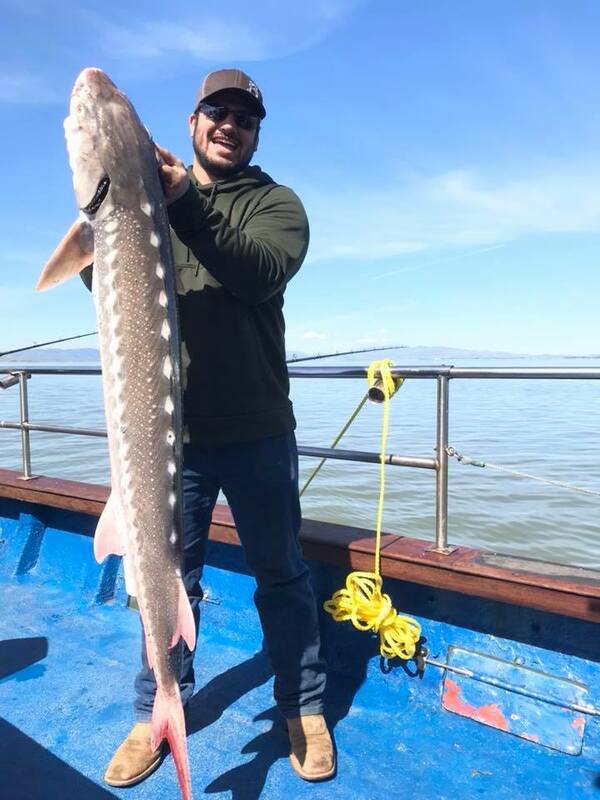 PITTSBURG – There’s guys that fish for sturgeon, and then there’s fishermen that fish for sturgeon. Want to know what kind of guys fish this derby? Fishermen. A football coach calls one of his best players on the team, a football player. When I meet an angler that’s at the top of his craft, I call him a fisherman. Here’s the statistics for the Spring Addathon according to the derby organizer, Andy Doudna. “A total of 110 sturgeon were landed by 27 teams which included 49 shakers, 39 slot sizers, and 22 oversize.” Pretty amazing. But what’s more amazing is these fishermen fought through some of the worst weather our region has seen in recent memory. Hail, rain, wind, thunderstorms, and day time temperatures only rose to a mere 50 degrees. Sounds like a great time to fish a derby that lasts 30 hours long, right? Separate guys that fish from the guys that are fishermen. The winning team consisted of Dustin Pestana and Kyle Dryer of Brentwood, scoring eight shakers, ten slot, and six oversize sturgeon. When I asked Dustin if they ever took cover in small water during the storms, he laughed. The second place team consisted of Anthony Cave DeFilippo and Duncan Berseth of Citrus Heights coming in with seven shakers, nine slot and five oversize sturgeon. When I talked to Anthony this week, he mentioned struggling to find fish. DeFilippo and his partner also stayed in big water despite the conditions. “We fished the Horseshoe and the Creek in Suisun Bay. We sat through the wind and the waves,” he said. Just to give the you an idea of the conditions during the derby: At 1:30PM on Saturday, the Port Chicago wind buoy was showing a steady 18 knots per hour with gusts to 25 knots. Flags were blowing inside Pittsburg Marina where Doudna and I waited out the weather during slack tide. Imagine what Suisun Bay looked and felt like for DeFilippo and Berseth, and all the rest of the competitors. Third place consisted of father and son duo Dennis Peidade Sr. and Jr., with two shakers, six slot and two oversize sturgeon. The first thing Piedade Sr talked about during our conversation was the weather. “It was miserable out there! I felt sorry for the guys having to fish in the thunderstorm! The rain and hail was coming down hard,” he related. “We mainly fished in the Horseshoe. The outgoing tide was better overall. We used salmon roe, but had out ghost and grass shrimp out. My son caught a striper on the shrimp,” Piedade Sr. said. 30 hours of fishing through wind, chop, rain, hail, thunderstorms and cold temperatures is not easy. That’s why I call all the anglers that have fished the Addathon Derby in the past or present, fishermen. It takes a certain breed of animal to stay competitive in this derby. Andy Doudna related to another element that made fishing difficult during the derby. “All winter long we’ve had the warm temperatures, but what’s key is we’ve had a good influx of freshwater that flushed into the Delta. That along with the sudden drop in temperatures really made for tough fishing,” he related. The Addathon Ironman Sturgeon derby is held bi-annually during the spring and fall and remains the only 100% catch-and-release sturgeon derby of its kind in Northern California. Many of us are familiar of the term, slayer – a word to describe guys that are good at fishing. But I think the guys that fish Addathon deserve to be called fisherman, because everyone I’ve met that’s fished this derby are class acts and they really care about the state of California’s sturgeon population. For more information on the Addathon Ironman Sturgeon Derby, check out the Facebook page or e-mail Andy Doudna at addathonderby@gmail.com.